We all love costume jewelry with its creative designs and statement look. However, if you own a couple of these pieces, you should also know how to clean costume jewelry. Sometimes, this type of jewelry tends to be more fragile than fine jewelry and you need to be careful about it. If you want to avoid ruining some of your favorite jewelry pieces, read further. In this guide, we will teach you everything you need to know about how to clean costume jewelry. If you own a copper bracelet or a beautiful pair of brass earrings with simple designs, it will be easier to clean them. Avoid using harsh soap or detergents. Instead, use a couple of drops of baby shampoo and a little bit of warm water. Mix them together and use a soft microfiber cloth which you can dip in the water. The next step in learning how to clean costume jewelry is to pay attention to its design. Simple pieces will only require you to rub them gently with the microfiber cloth. Then, you can rinse them using another lint-free cloth and lukewarm water. Make sure you dry your jewelry, though. Many people don’t know how to clean costume jewelry and forget to dry it, which can lead to discoloration. Simply use a tissue or cloth to dry out the piece, then put it safely in your jewelry box. Yes, that statement necklace or that pair of chandelier earrings will be more difficult to clean. But don’t worry. We are here to teach you how to clean costume jewelry regardless of its design, so read on. You will need the same mix of baby shampoo and warm water but, instead of a microfiber cloth, use a very soft jewelry brush. This will help you reach the tough spots like the setting or the necklace clasp. Be very careful when you rub the jewelry piece with the brush. Even though you are using a jewelry brush, costume jewelry can be rather fragile. If you want to learn how to clean jewelry like an expert, think about how you would clean a raw egg with a brush. Use the same pressure you would use with the egg and rub very gently. Afterward, rinse the piece using a lint-free cloth dipped in plain water. Dry it with a tissue and store it in your jewelry box. Learning how to clean costume jewelry is not enough. You also need to know what to avoid when wearing it and how to store it. Perhaps you may have noticed that some pieces have changed their color. There are a couple of reasons why this happens. Water is one of them. 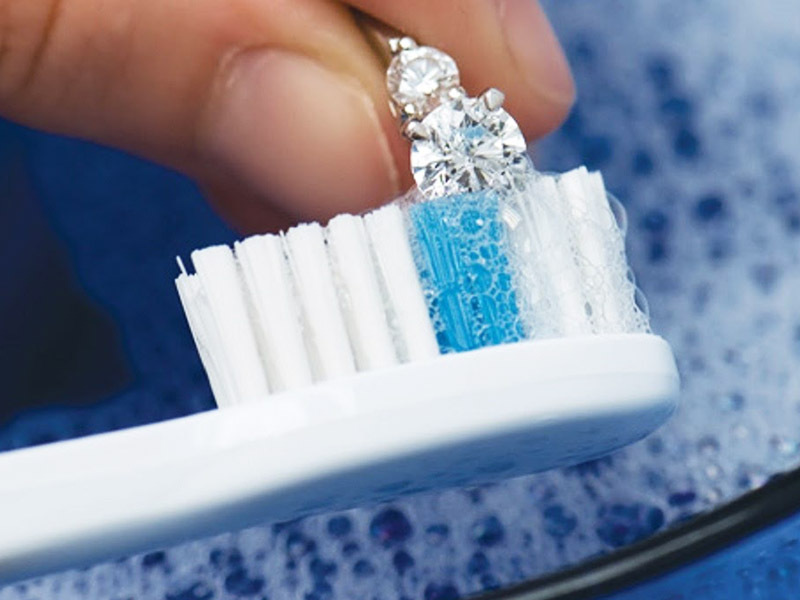 This is why when we wrote about how to clean costume jewelry we only referred to dipping a cloth or a jewelry brush in water. We would never tell you to dip your jewelry in water as this is the no. 1 enemy of costume jewelry. When you take a shower or go for a swim wearing your costume jewelry, you expose it to water and chances are it will suffer discoloration. Or it can rust if it contains enough iron. Sweat is also an enemy of costume jewelry, so never wear it while going to the gym or jogging. Last, but not least, there is a reason we said no harsh chemical when learning how to clean costume jewelry. 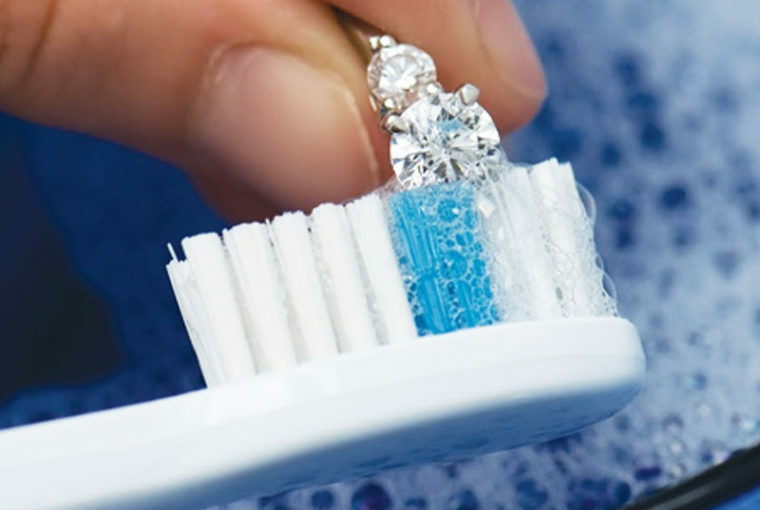 Detergents, body lotions, and perfumes will react with the metals in your jewelry causing it to become dull. When talking about costume jewelry, it’s important to wipe it with a lint-free cloth after you wear it. This will ensure the oils in your skin or perspiration won’t stay in contact with your jewelry. Another important thing, besides learning how to clean costume jewelry, is to store it in airtight plastic bags inside your jewelry box. This will prevent your favorite pieces from suffering discoloration. Even your necklaces, which you usually hang from a necklace tree, will be better off in airtight plastic bags when it comes to costume jewelry. To prevent them from forming knots, be careful when you store them and make sure they are not in the same bag as other jewelry. This is the crash course on how to clean costume jewelry. If you follow our advice, your pieces will look wonderful for a very long time. And guess what? We have more useful advice, as well as styling tips, on this blog. Read on for more articles about jewelry. Also, don’t forget to visit Ana Luisa online jewelry shop. We have a great collection of unique fashion jewelry which you will fall in love with.